First up, the DD Reliquary (beta) text is now available to one and all here. The DD Reliquary character sheet is now available free to all here. It's A4 sized only at the moment, but I'm working on a letter sized version too. The professionally proofread DD Reliquary (gamma) text is now available here. This will be the final pre-press release of the DD text; the next "official revision" will be the for-press release. The DD Ref Rules v3 PDFs will be this text less a few examples and duplicated phrases. The DD Reference Rules V3 volume I and volume II PDFs are now available from the download page. The volume III PDF is still in the pipe. The DD Reference Rules V3 volumes I, II, and III are now available from the download page. Version 3 is now the current stable version. The Delving Deeper Reference Rules Hypertext document is now online. If you notice any funny links or other issues that need dealing with, please comment here so I can address them. 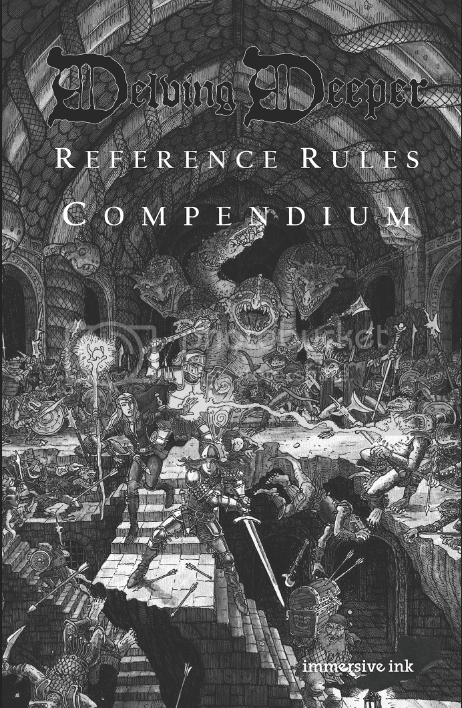 The Delving Deeper Reference Rules Compendium is now available via Lulu.com's Print On Demand service. Cover art by Tim Ide. Includes all three volumes of the Ref Rules V4 (same as the Hypertext version) built into a single 130 page, digest-sized booklet. The DD Illusionist is here! This time around it's a 9 digest-page mini-supplement written for DD-- but should work right out of the box with any 0e-style rules--and includes 40 revisited and/or new "spells". With many thanks to my esteemed proof-readers/reviewers: Ethan Sincox, Peter Frohlich, and Mike Tremaine, and all others who commented along the way. DD V5 Progress Drops Are Here! All free downloads from here.